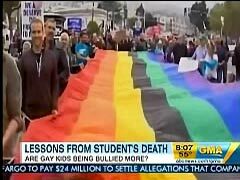 According to ABC's Juju Chang, "wedge issues" like gay marriage can be linked to the bullying of homosexual teens. On Thursday's Good Morning America, the news anchor connected the subject in a piece on why a "seemingly accepting society" would allow harassment. The reporter complained, "But despite the progress, gay issues are wedge issues in this country. 29 states effectively ban gay marriage." Effectively banned? Without explaining the connection, she added, "And there's Don't Ask, Don't Tell." GMA allowed no dissent on the subject. Guest Pollack insisted, "...Suicide and depression happens, not only because of confusion, but because of the message that our society is given. A homophobic message. That being gay is bad. Being gay is sick." Is it possible that someone could oppose gay marriage or Don't Ask, Don't Tell and not support bullying? ROBIN ROBERTS: Now, a discussion on a topic brought to light by the recent events at Rutgers University. A recent study says gay teens are actually four-times more likely to be bullied than straight teenagers. But the study comes at a time when tolerance appears to be so high. So, why the disconnect? Juju takes a closer look. JUJU CHANG: The wounds from Tyler Clementi's tragic death continue to fester. FEMALE STUDENT: A statement needs to be made that the school doesn't tolerate things like this. MALE STUDENT: It's not something that should have happened. CHANG: It's difficult to understand how and why in today's seemingly accepting society, the gentle 18-year-old violin virtuoso could have reportedly felt so ridiculed for his sexual preference that suicide became the only answer. Tyler's story grabbed headlines, even the cover of People magazine. But away from the media glare, at least three other teens have taken their own lives just this month after reportedly facing relentless taunting about their possible sexual orientation. This climate of fear and hate may appear at odds with the public strides made by gay and lesbians in recent few years. There's gay talk show hosts, openly-gay award show hosts. NEAL PATRICK HARRIS: Hello, everybody! CHANG: Primetime shows celebrating gay relationships. FEMALE CHARACTER: Our boyfriends totally rock. MALE CHARACTER: I know, right? CHANG: Even gay roles that teenagers can emulate. MALE TEENAGER: Too late for second guessing. CHANG: But despite the progress, gay issues are wedge issues in this country. 29 states effectively ban gay marriage. WOMAN YELLING: You don't know about love! You don't know about love! CHANG: And there's Don't Ask, Don't Tell. But preventing kids from being cruel may prove to be the fiercest battle yet. And celebs are speaking out about it. ELLEN DEGENERES: We can't let intolerance and ignorance take another kid's life. And I want anyone out there who feels different and alone to know that I know how you feel. TIM GUNN (Project Runway): I have a 17-year-old youth who was in quite a bit of despair. I attempted to kill myself. You're not alone. It will get better. CHANG: Even Margaret Cho showed her support on her final appearance of Dancing with the Stars, wearing this rainbow outfit to send a message to gay and lesbian youth. MARGARET CHO: We wanted to impart that message of pride to all kids out there. CHANG: A simple message of tolerance out there for all the kids out there who feel they don't have a voice. ROBERTS: We want to point out that we spoke to the attorney for Tyler Clementi's roommate. And he told us that his client denies that this incident was a bias crime.